Destinations: Srinagar, Dal Lake, Sonamarg, Nichnai, Vishansar Lake, Krishansar Lake, Srinagar. Destinations Details: Srinagar, Dal Lake, Sonamarg, Nichnai, Vishansar Lake, Krishansar Lake, Srinagar. ​​Sonamarg means a 'meadow of gold'. The most important township in the fertile Sind valley, Sonamarg is the last major township in Kashmir on the road to Ladakh. Sonamarg is also the staging point for some of the most popular treks in the higher altitudes. 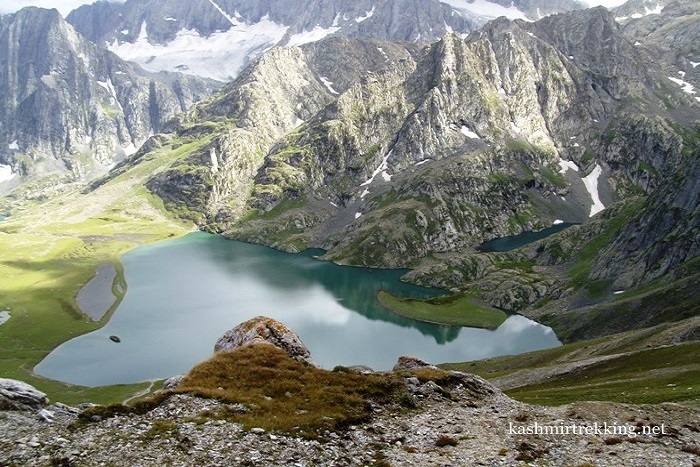 The most popular trek originating from Sonamarg is the Vishansar and Krishansar Trek. It covers the lakes of, Vishansar Lake and Kishansar Lake. Day Details On your final day of the Kashmir Short Trek, start from the Vishansar camp, ramble on grassy land dotted with yellow flowers and pine forest. Descend and reach Sonamarg, the last leg of your trek. Reach Sonamarg Village in Ganderbal District. Be driven back to Srinagar and unwind in houseboat for the night. 04 Nights accommodation at Mountain in Tents.